I sometimes ding Dave Hargrave for having things on charts and tables that aren’t in the book, but here, he lets us know that all the monsters in the Arduin Grimoire encounter charts are described in that volume. Or in this volume. Or in one of the three volumes of “All The World’s Monsters”, which I happen to have and might go through at some later point for your amusement. Or in the “Monster Cards” sold by Russell Powell of Long Beach, CA. Or in Dave’s filing cabinet, either under ‘M’ for ‘Monster’, ‘C’ for ‘Critter’, or ‘T’ for ‘To Be Filed Later’. I may have made up the last part. If you don’t have the time or imagination to make up your own stuff, read “Alarums & Excursions“. As far as I know, it’s still going! The first “Have you tried roleplaying in this roleplaying game?” rant? Pick One Of The Hobbits In “The Hobbit”. There Were So Many. The “Common Tongue” is simply the dominant language of the local region; there is no global language. The alignment languages of Chaotic, Neutral, and Law (you can tell when in the history of D&D this was written!) are pidgins composed of vocabulary from the races most associated with each alignment. Never tell players what kind of monsters they’re fighting! Show them a picture. Did I mention I sell cards with monster’s pictures on them? Generally, good advice — don’t reveal the monster’s hit points, AC, special abilities, etc., until the players figure them out. Place monsters and treasure YOUR way! It’s YOUR world! Eternal truths there, mate. The saga of George and the Mu-Meson blade. Lightsabres (also lightsabers… seriously, I spent time googling this and found both spellings equally common in official and quasi-official sources), of course, appeared in 1977, a few years after D&D and right about the time the Arduin books were published (Skull Tower is from 1978). So, naturally, they invaded game worlds. Undoubtedly, some folk at the time were whining the game had abandoned its roots in authentic fantasy fiction and was becoming a video game, with everyone just “Ponging” and “Breaking Out” instead of pouring water on the floor to see where the pit trap is, like they did in the good old days of last week. “Competence” is finally fully defined as meaning you are so good at something, you are PLUS TWO (+2) at it. (Caps and parentheticals in original.) +2 to your saves, -2 to opponents’ saves, and +2 to each die(!) of damage done. Now, following an odd hodge-podge of notes, thoughts, and hints, we get to travel times. Why not? These are times on good roads. Travel times are reduced by 1 mile for each amount of weight carried that is equal to 20% of your maximum weight allowance, compounded monthly. Man, even with those stubby little legs, dwarves can book it! “All Half-Elves” implies there’s more than one kind of half-elf… dwarf/elf? Hobbit/elf? Phraint/elf? “Hobbits, etc.” What’s the “etc”? Kobbits, perhaps? Orcs travel as fast as elves… and last longer… and need to stop less. Sauron improved the breed, clearly. Human women can travel 16 miles a day, but Amazons can travel 20 miles a day. So this sort of answers the question of whether Arduin Amazons are a species or a culture. My spell checker suggested replacing “dwarves” with “adwares”. Go home, spell checker. You’re drunk. Next is a discussion on inter-city coach lines, with their rates and travel times. 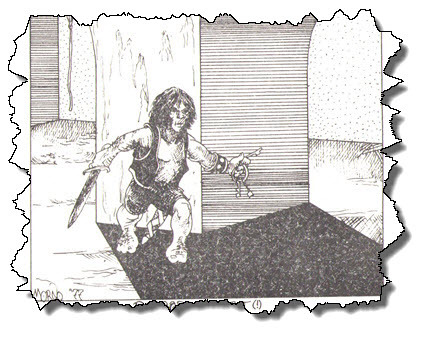 It’s one of those little bits, of which there are many scattered in the Trilogy, that make you stop and think about the nature of day-to-day life in your world, and remind you that the campaign setting doesn’t, or shouldn’t, consist entirely of The Town (containing the The Blacksmith, The Temple, and The Inn) and The Dungeon. 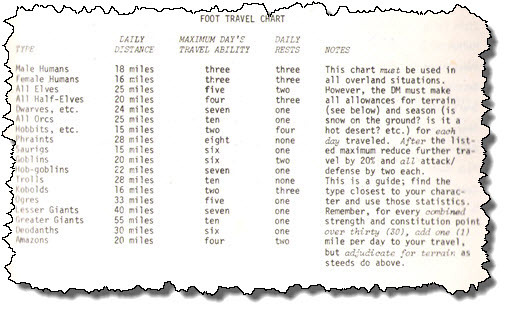 Then, horses, and other riding beasts, a chart cross-indexing type (including camel and ox) with five grades (six, if you count the assumed ‘average’) to yield a travel time, which will then be adjusted by terrain. We’ve covered on-foot travel times, horse travel times, coaches, and wilderness escape chances. Now, saving throws vs. medusa. The next item is a saving roll chart for “all stoning of the glance or gaze variety”, based on both the level of the character making the save, and the distance from the gazing or glancing (is there a difference?) creature. Oh, wait. This isn’t the saving roll vs. stoning chart. This is the saving roll vs. saving roll vs. petrification chart. Seriously. If you fail your roll on this chart, then you need to roll your normal saving throw. Otherwise, you avoid the gaze. Me, I assumed the saving throw, at least in part, modeled “not looking at the damn thing in the first place”, but some people wanted more detail. Meanwhile, here’s a barbarian hobbit. If you’ve never read the blog “WTF, Evolution?“, go read it. There’s stuff there that makes the platypus look sane, and would be all the more reason to ask a Divine Creator what the HELL he was smoking. Also probably inspiration for some really messed up fantasy creatures.